With a revolutionary and patent pending design, Goose Golf Solutions launches their latest product, the Gravity Brush. 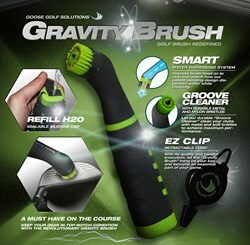 Goose Golf Solutions officially announced today the launch of their newest golf accessory, the Gravity Brush. The revolutionary and patent-pending design is what separates the Gravity Brush from its competitors. With over two years of careful research and design, the Gravity Brush has been carefully planned in an effort to be the best, most effective and most efficient golf brush on the market. With the patent-pending head design, the Gravity Brush incorporates a combination of soft bristles, copper bristles and a 'groove cleaner' to achieve maximum performance. The Smart water dispensing system automatically releases water when the 'groove cleaning' bristle is depressed onto the clubface. This unique and patent-pending design, is what differentiates this product from other golf brushes. The water reservoir will hold enough water for four rounds of golf before refilling. "We're pleased to be presenting the evolution in golf brush design with the Gravity Brush," said Daniel York, Director of Operations for Goose Golf. "We have taken the steps to redefine the functionality and execution of one of the most essential tools in golf. We're really excited with our product line and to see it hit the hands of golfers. We're looking forward to receiving feedback from the golf community and continuing to indulge in our passion for creating golf products with a vision that remains true and pure to the game." Consistent with Goose Golf's principle in creating quality products at reasonable prices, this is the perfect testament to the Gravity Brush. With a high quality standard and careful execution, the Gravity Brush will become an essential part of every golfers game. Custom corporate logo'd products are also available which Goose Golf expects the value, design, and quality to far exceed any other corporate products. The flexibility to logo the brushes allows for maximum corporate identity exposure at a very competitive price. Goose Golf is a North American manufacturer of high quality golf accessories. With the success of the innovative Goose Towel, and now the launch of the Gravity Brush, Goose Golf continues to produce high quality golf accessories that stay true and pure to the game. Find out more at: http://www.goosegolf.ca.